For Valentine’s Day I wanted to wear a bracelet with all of my hearts. I wasn’t quite sure if I wanted to add round or dangling beads as well, but I can make a decision at a later time. Zum heutigen Valentinstag wollte ich ein Armband mit all meinen Herzen tragen. Ich war mir nicht ganz sicher, ob ich runde Charms oder Anhänger mit Herzen ebenfalls auf dieses Armband geben wollte. Aber darüber kann ich mir später auch noch Gedanken machen. These PANDORA and THOMAS SABO bracelets are the ones you’ll see me wearing very frequently lately. I wear lots of pinks and hearts, so there was no need to buy (a) new charm(s) for the heart bracelet.. Just using what I had was the idea. Momentan trage ich diese PANDORA und THOMAS SABO Armbänder ziemlich regelmäßig. 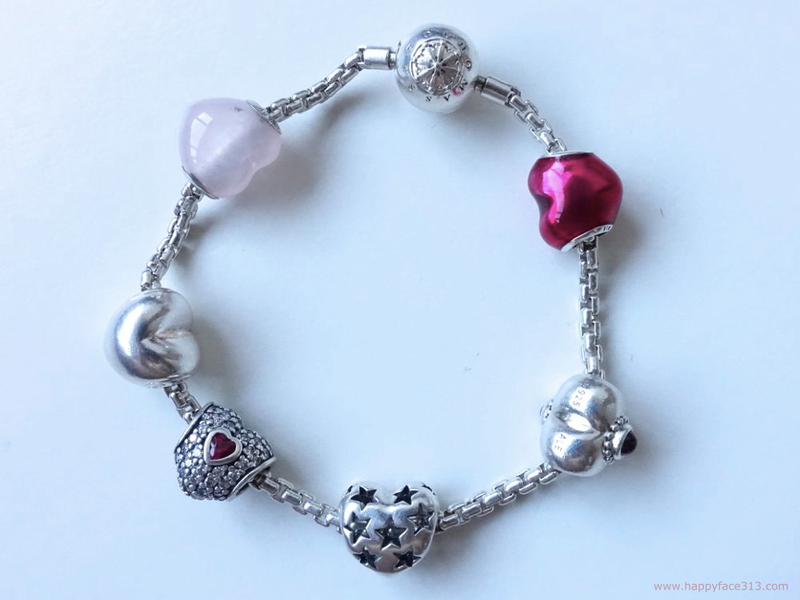 Pink und Herzen sind sehr dominant, so dass ich kein(e) neues(n) Charm(s) für das Herz-Armband kaufen musste. Ich wollte nur das verwenden, was ich ohnehin schon habe. About a year ago I showed you how I combine my bracelets and the compatibility of the THOMAS SABO and PANDORA systems here. Vor rund einem Jahr zeigte ich Ihnen hier, wie ich meine Armbänder kombiniere und auch, wie kompatibel die THOMAS SABO und PANDORA Systeme sind. 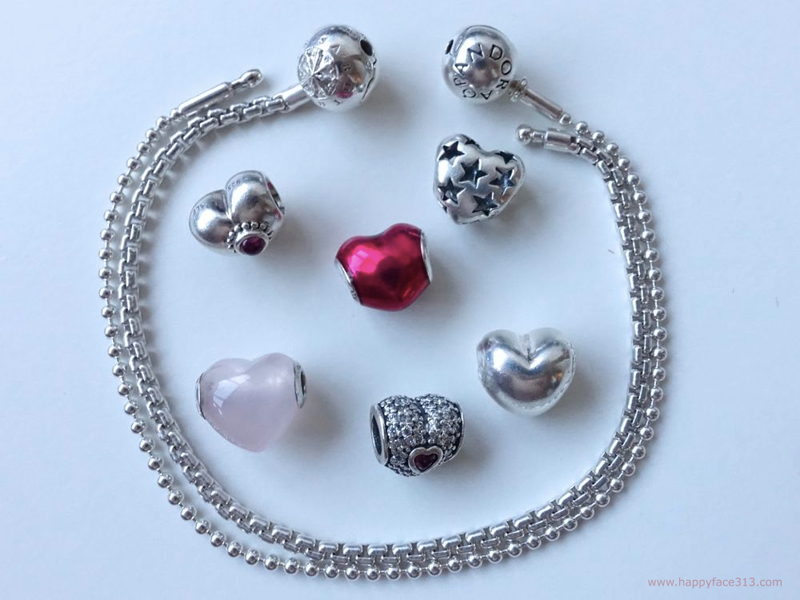 In total I have six hearts – 2 are THOMAS SABO KARMA Beads and 4 are regular PANDORA beads. Karma beads don’t fit regular PANDORA bracelets. 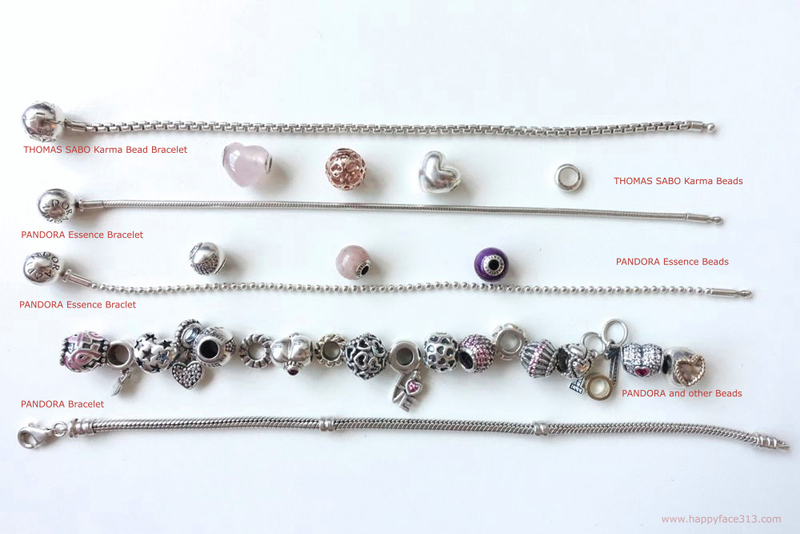 Insgesamt habe ich 6 Herzen – 2 sind THOMAS SABO KARMA Beads und 4 sind reguläre PANDORA Herzen. 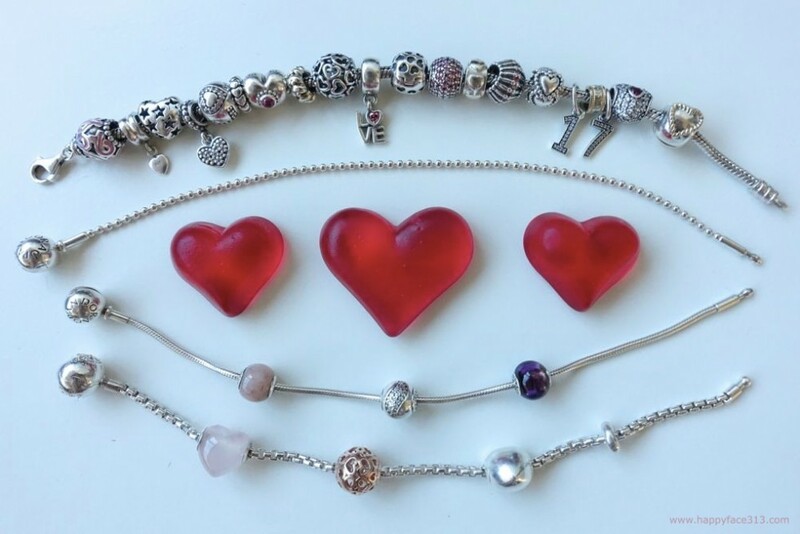 Karma Beads passen nicht auf die normalen PANDORA Armbänder. …as well as the THOMAS SABO Karma bracelets. Please keep in mind, that the Essence bracelets are more delicate and not as sturdy as the regular PANDORA bracelets. So I feel that one should be cautious about the weight added. 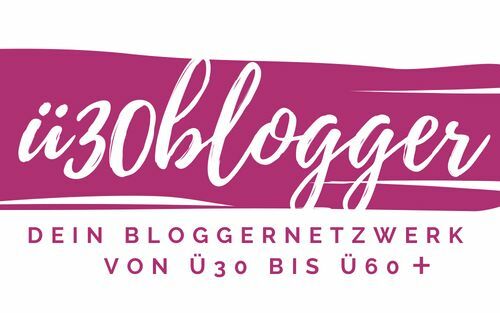 …wie auch auf die THOMAS SABO Karma Armbänder. Bedenken Sie bitte, dass die Essence Armbänder etwas filigraner als die regulären PANDORA Armbänder sind. Das sollte man im Auge behalten, wenn man Gewicht hinzu fügt. I’ll be wearing this bracelet today. And you? Ich werde heute dieses Armband tragen. 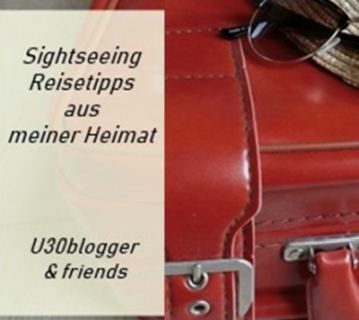 Und Sie? Sehr hübsche Stücke hast Du da. Komischerweise trage ich aktuell kaum Arm oder Ohrschmuck. 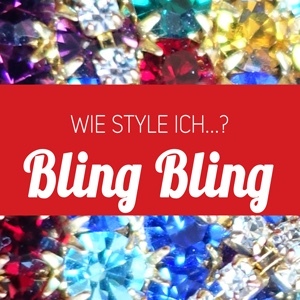 Maximal Ketten und RInge. Keine Ahungung, warum das so ist. Wird wohl eine “Phase” sein. Very pretty. I believe you mean “Compatibility” in your title, if you don’t mind me saying so. 🙂 Thank you very much, Janet! Of course I don’t mind! I’m grateful for you telling me! Das ist ja interessant ,fein das alles so gut kombinierbar ist und wirklich wunderschön aussieht! Ich mag es, wenn man seine Sachen bestmöglich kombinieren kann. 🙂 Oh, that is so nice, Carie! A pink leather bracelet with pink hearts <3 Love the idea! Looking forward to a picture of it! Question…. Can you also connect the Pandora essence and Sabo bracelet? 🙂 Sorry for my super late reply, dear Monique! I realized only now that I owe you an answer. What do you mean by “connect”? To connect several bracelets to a chain? No, that doesn’t work. I’ve tried it for you. 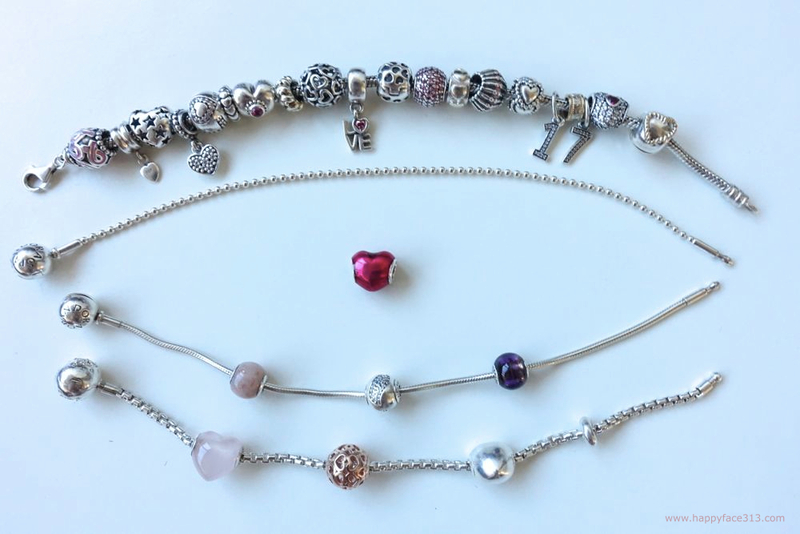 You can add several regular sized Pandora and Essence bracelets to a chain. But the Thomas Sabo “plug” is a bit thicker and doesn’t fit into the Pandora barrel. 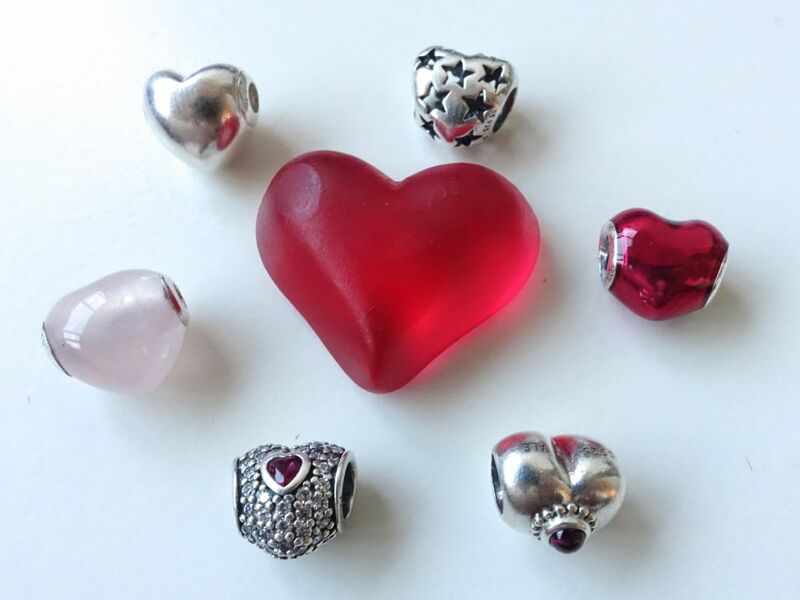 I just got two Rose Quartz Heart and one silver openwork Heart free, Thomas Sabo has buy two Karma beads get one equal or less value free until 30th March. I started collect Karma since 2015 Sept free bracelet promotion, I got two free bracelet. I like their semi precious stone and silver bead but not paved cz bead. Karma is much better than Pandora Essence, I don’t have Essence but I like Pandora Moment for fun especially Canada has many promotion and GWP, I go to outlet store to buy the discounted retired charm. I only collect Pandora Moment and Thomas Sabo Karma, like this two line the most. 🙂 Wow, you have quite a collection there! It’s true the Thomas Sabo Karma Bead collection is really pretty! I’m slowly adding to my collection here as well. Love them … and Pandora too … but don’t fit my wrist .. I need to wear men’s watches. So I wear very seldom bracelet. Dia, what a lovely thought … I’m glad you know me that well. *smile – it would have been a waste.